We offer expert roofing repair in the Midland area. Is your roof looking worse for the wear lately? You might be thinking that you need to do something about your roof, but are unsure what to do. 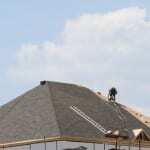 No matter what the problem is with your roof, we can help you at Slippery Slope Roofing. We have been doing roofing repair in the Midland, Ontario area for several years, and we work on roofs of all shapes and sizes. Missing shingles. If you notice areas that have patches of shingles missing, they need to be replaced before the weather damages the roof. Granules from the shingles in your rain gutters. This means that your shingles are wearing down and are no longer providing the protection they should be. Water leaking into your home. If you notice wet spots on your ceiling or in your attic, it probably means your roof is leaking. If you see water dripping into your home when it is raining, then you most definitely have a leaky roof. Your roof sags or dips in certain areas. This means that there is either water damage in some places, or the roof is no longer structurally sound. If you notice any of these problems going on with your roof, call us at Slippery Slope Roofing as soon as possible. Our expert roofing repair crew can have your roof repaired so that no further damage is done. We will work on your roof from start to finish. We will only do one project at a time, so we can devote all of our time and attention to our current project. You will be in good hands with us.